Hello everyone. Hope you are all well. Well autumn is definitely here. The leaves are falling down, the temperature is falling, Guy Fawkes Night has passed and most frighteningly of all the Christmas lights are now being switched on! They say it seems earlier each year and I agree! With the plethora of adverts now being shown and shops selling their Xmas gear maybe it is time to think about planning for the event itself. Well whatever the case, entertainment is an important component to help make the season jolly! 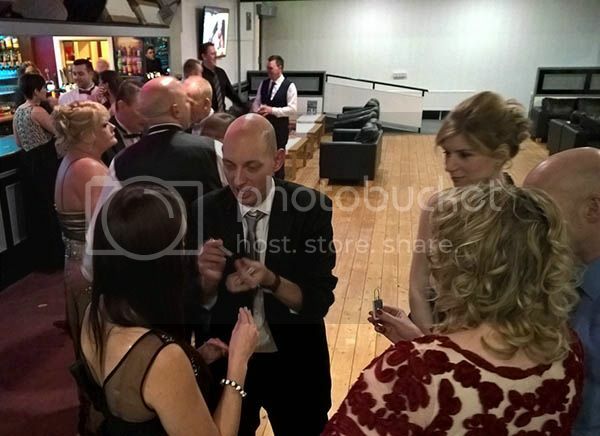 A Close up Magician is a great way to entertain your staff or guests. Provide magic at the tables at your Christmas ball or dinner entertaining your guests between courses, helping the night flow, filling in those gaps when the waiting staff are going round feeding you! Mix and mingle magic at a cocktail party, helping break the ice among people who may not know each other, helping people get into that festive mood proving amazing Christmas Magic. Of course another good time to have a party is just after Christmas, in January. This can help boos that back to work blues many people will surely have, plus you may even get the location you wanted for a cheaper price! This time is usually less busy for a magician as well so there is more chance of getting your required date if you wish to book. Last year I was honoured in January to provide entertainment for the Total Lindsey Oil Refinery ball in sunny (!!) Cleethorpes. This was a huge ball spread over three nights and I along with a colleague provided table magic. The comments received show that the magic was hugely appreciated with people talking throughout the night about how amazing the tricks were and how they were so confused! Don’t delay and get in contact now to see what I can provide and get a quote. So what better way to spend it then in haunted pub with two magicians. Along with fellow York Magician Craig Stephenson, we will showcase some of our favourite effects in an evening of laughter, magic, mindreading and the occasional ghost story. So come join us this halloween in the Black Swan - A pub standing in York since 1417.... therefore bound to be packed with all sorts of history.. and spirits!